Mr. Duffy, did I ever tell ye what the most frightenin’ words I ever heard spoken on the bridge of a starship were? Well, here they are: “Mr. Scott, you have the conn.”. The second novelization of the e-book series involving the tech folks in Starfleet has an interesting range of stories this time around. We get a conclusion to a two part story (from Have Tech, Will Travel), a surprise encounter aboard a Cardassian space station, and what could be considered a part murder mystery, part slash flick. The first story on this one is “Interphase, Book Two”. As with the first book, “Interphase” was written by Dayton Ward and Kevin Dilmore. When last we encountered the S.C.E., one team was aboard the Constitution Class U. S. S. Defiant, lost in the interspatial rift where it has been for over one hundred years. The rest of the gang is aboard the da Vinci, dealing with Tholians who have inexplicably begun to attack. This story does a decent job of balancing the action elements with the problem-solving ones, as Lt. Commander Duffy (second officer of the da Vinci) deals with the rather unfamiliar situation of commanding a starship in battle, while the team aboard the Defiant work to not only escape interspace, but deal with the revelations about how the Defiant got into this mess in the first place. The second story is “Cold Fusion”, and this offering was written by Keith R. A. DeCandido. 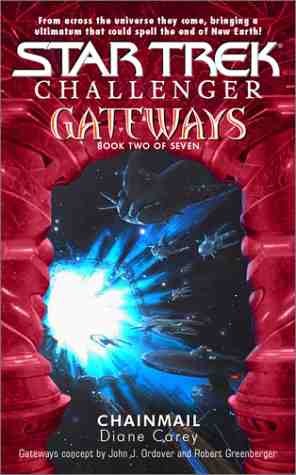 This book actually takes place in between Deep Space Nine novels Avatar and Abyss. 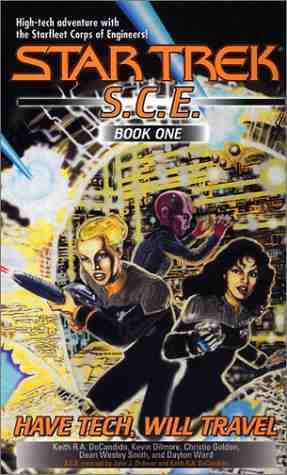 The S.C.E. is called in to aid Deep Space Nine in repairing the damage done to it in the events of Avatar, and with the help of Lieutenant Nog of DS9, they go to scavenge the fusion core from Empok Nor, a similarly built Cardassian space station long abandoned…or so they think. We also get a look at a group of aliens called the Androssi, who are just as tech-savvy as the S.C.E., but are interested in profit (hm…techno-Ferengi….). The story also shows that the S.C.E. had just as exciting a career before the time of these stories. The final story was released as two e-books originally. “Invincible” was written by David Mack and Keith R. A. DeCandido. “Invincible” takes place at the same time as “Cold Fusion”, and centers on Sonya Gomez on the world of Sarindar; because of her experience and knowledge of subspace accelerators. Unfortunately, between native superstitions and some ugly surprises, Sonya finds that she’s gotten more than she’s bargained for on this assignment. Because this story was originally released as a two parter, it takes up the bulk of the book; I also found this to be the most interesting, as it focused only on a single Starfleet character, working under rather stressful circumstances (which I won’t go too much into here). It also shows some of the usual blind spots that Starfleet officers have in this kind of situation. Miracle Workers follows the same vein as Have Tech, Will Travel; while there were fewer stories in this book, they were substantially more interesting, hinting at a deeper history behind the characters and developing them further. That really can’t be all that easy with the average size of the stories, but I find the pacing to be just fine. One issue I did have with this book was the extra pages-nearly 100-dedicated to a minipedia detailing information from these two books. To be honest, I’d have rather scrapped that and included another story (of course, I say this without any knowledge on which e-book followed “Invincible”, so perhaps it was the lesser of two evils). I wasn’t fond of the minipedia for New Frontier books, and I’m equally unenthused about this one. Aside from that detail, though, I found Miracle Workers to be a solid book, and worth a read. I especially liked all the dramatic pauses. Isn’t it interesting whenever there’s something really, really bad going on in the galaxy, the only ships that can get to them are ones named Enterprise, Defiant, or Voyager? Ever wonder what the stories were behind some of them? Well, that’s the drive behind The Brave and The Bold-we get to see the characters of the Original Series, the Next Generation, Deep Space Nine, and Voyager in a different light. We see them through the eyes of other crews, other captains (some of whom aren’t even Starfleet). I have to admit that I was looking forward to these books, just to see the team-ups shown on the covers. 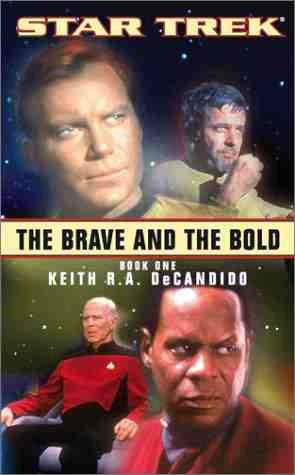 The Brave and The Bold is actually not a single story, or even a two parter; rather, it’s a quartet of short stories, with a prologue involving another ship called Enterprise, and linked together by a common thread. In this case, the thread is the existence of a quartet of artifacts from an ancient alien civilization. Those artifacts, unfortunately, were created on the behalf of a power-mad tyrant named Malkus the Mighty, to give him the power over life and death, the power to overcome any enemy, power over the elements, and power over the mind. The stuff of fantasy, maybe-but someone made them a reality. This discovery prompts Starfleet to issue a General Order to confiscate these artifacts should they actually be found-because they are far to dangerous to leave laying around. Does it really need to be said that certain crews become involved? In the days of Kirk’s Enterprise, Commodore Matt Decker gets a distress call from Alpha Proxima II, and his ship-the Constellation-answers the call, along with the Enterprise. The planet seems to be undergoing the effects of plague, although the plague seems curiously targeted-while there seems to be no means of transmission, it has conveniently wiped out the government as well as other apparently random locations. Kirk and Decker find themselves in the unusual situation of having to deal with the problem without much in the way of local support. It quickly becomes apparent (thanks to certain emissions) that the cause is one of the Malkus artifacts-which means they not only have to find a way to stop the plague, but they need to find the artifact-and the person using it. While we get to see a lot of Kirk and Decker (who isn’t really sure about Kirk at first), we also get to see the two ships’ doctors and science officers work together a bit (while Dr. Rosenhaus seemed way too similar to Dr. Bashir in his early years-as in, full of ego-I really enjoyed Lt. Masada’s interactions with Spock). In the early years of Starfleet’s administration of Deep Space Nine, Captain Keogh of the Odyssey comes to Deep Space Nine to meet with Captain Sisko; Keogh’s assignment is to aid in converting a portion of one of Bajor’s moons into farmland, transport some Bajorans to farm it, transport some supplies to the colony of New Bajor in the Gamma Quadrant, and do a bit of patrolling of the Cardassian border, especially as the Maquis are beginning to become active. The mission sounds so simple; the problem is that one of the folks coming home to farm is a Bajoran named Orta (I don’t recall seeing if there was more to his name, but memory may simply be escaping me at the moment)-a man who was more of a terrorist than a freedom fighter. Unfortunately, Orta’s got a new toy, and big plans for it…. Keogh struck me as “cranky”; he doesn’t really get along with anyone, especially Jadzia Dax (who just loves pushing his buttons, naturally); actually, the phrase “stuffed shirt” comes to mind. A more interesting character is his first officer, Commander Shabablala; he’s recently lost a captain, and isn’t interested in losing another. And of course, I’m always happy to see Chief O’Brien, Constable Odo, and Commander Sisko again. 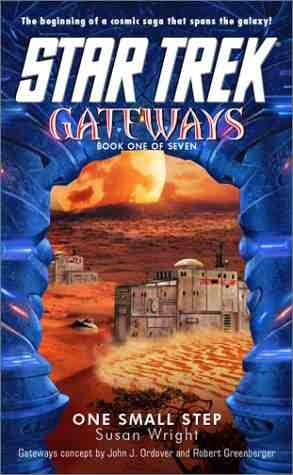 The second book opens with the answer to the question, “Just how did Tuvok, a Vulcan in Starfleet Security, manage to infiltrate the Maquis?”. The answer-partially by accident, and partially Starfleet’s very careful planning. 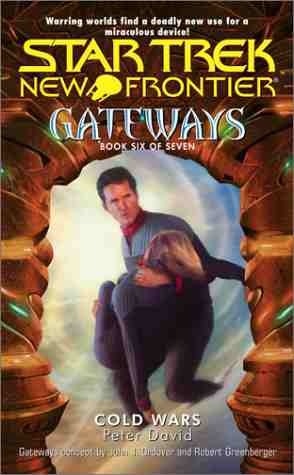 This story has a bunch of “captains”: we get Captain Janeway (but she’s mostly a cameo role in this one); there’s also Captain DeSoto of the Hood, who’s been mentioned a few time in Next Generation; but we also get a pair of Maquis captains-Chakotay and Cal Hudson (who appeared in the earliest appearance of the Maquis). It’s the Maquis who gets into trouble this time, as one of their own discovers one of the artifacts-and he sees it as the perfect weapon to use against the Cardassians. To be honest, the Maquis get most of the page count on this one, since they’re the ones on-site; the story doesn’t suffer one bit, though; watching them try to figure out why Tuvok’s defecting is one of the high points of these books. 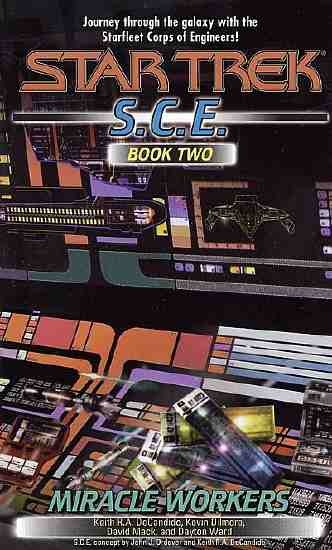 The final story features Picard’s crew and Enterprise-E, as well as a number of guest stars (which I won’t go into detail on, for reasons that the reader will figure out fairly quickly); it also features the return of some of DeCandido’s old friends-Captain Klag and the crew of the I.K.S. Gorkon, last seen in Diplomatic Implausibility. Klag’s responsible for transporting a famous Federation doctor to a speaking engagement to the Klingon homeworld to point out some of the obvious benefits of medicine to a species notorious for preferring to keep debilitating wounds as a matter of honor; unfortunately, the doctor’s shuttle is lost in transit. Other disappearances across the quadrant lead Klag to join with Picard to find out where the missing went, and the two end up where the last artifact can be found. The best moment in this story comes from a “meeting of the minds” between two characters who you’d never suspect as being so much alike in their past experiences. When planning this review, I wanted to be a little cautious; I’m generally inclined to like DeCandido’s work, as he’s consistently gotten characters written right in every franchise I’ve read, from Star Trek to Marvel Comics to Farscape, so I figured I’d need to fight that instinct. 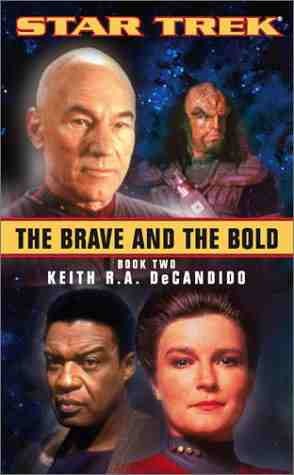 After reading The Brave and The Bold, I gave up; I can’t really help that I like his writing! The only characters that seemed a little off were the ones in the prologue, but they haven’t been around all that long, and I haven’t really gotten a handle on them either. Also of note is the fact that DeCandido is making use of info that’s been sprinkled throughout the DS9 relaunch books, primarily info concerning Andorians, although one of the DS9 relaunch characters also has a very brief cameo. I found these books to be fun reads; the first one primarily because of the chance to see famous crews seen through the eyes of others; the second one primarily because of plot situations (Tuvok and Captain Klag’s crew). The thread binding the four stories together works for me, given all the things we’ve seen in Trek lore, and the length of time taken between the findings of the artifacts makes sense given the size of the quadrant, and the fact that it gets smaller every year. So go ahead and pick up The Brave and The Bold. It’s like reading extra episodes of Star Trek in all its incarnations. Lord and Lady, not another heroic quest. I’m afraid so. Dragon’s been told to keep a special eye on them. Those types always get into brawls. Or worse. I remember that group that wiped out the Boar’s Head Inn. I don’t know that inn. You wouldn’t, boy. Even if someone like you would be caught dead in a place like that, it got burned to the ground before you were born. 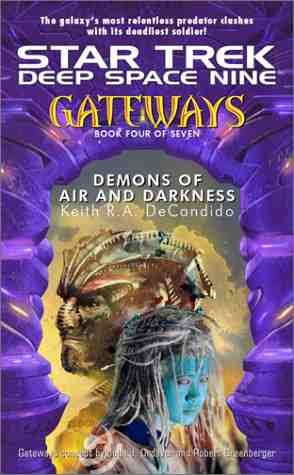 I’ve reviewed books by Keith R. A. DeCandido before. I’ve commented on how he manages to nail down the characters of every licensed property he’s been involved with, going back from the Marvel Comics novels, to Star Trek, to Farscape. He’s become known for his IKS Gowron books of late, where Klingons seek out new life, new civilizations, and conquer them. However, all of his books to date have been in somebody else’s playground. Until now. 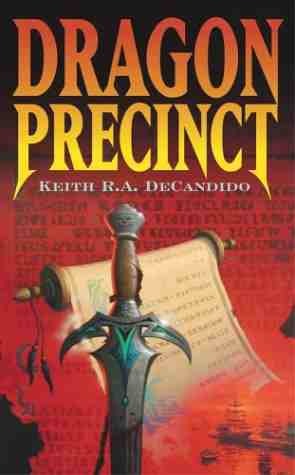 Dragon Precinct is a fantasy novel; however, it’s not about warriors, wizards, and priests going on a quest. Well, actually, it is about warriors, wizards, and priests going on a quest-but those characters aren’t the protagonists here: they’re the victims of murder. The world-famous Gan Brightblade and his allies are in the city-state of Cliff’s End, at the behest of the priest Brother Genero; Genero has had a vision of a great evil returning in the form of the wizard Chalmraik the Foul. Never mind the fact that the wizard was killed ten years ago. Unfortunately for those heroes, someone-or something-has decided to have at these heroes before they get too far. Enter the Cliff’s End Castle Guard. Lieutenant Danthres Tresyllione and Lieutenant Torin ban Wyvald investigate a death in the Dragon Precinct-specifically, the death of Gan Brightblade. 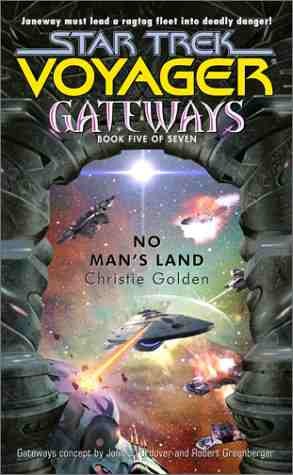 Unfortunately, there isn’t much for them to find; there are apparently no clues, physical or magical, no apparent motive, and the crew Gan traveled with are unwilling to tell the truth about why they are in town. Then, of course, there’s also the little detail that the rulers of Cliff’s End, Lord Albin and Lady Meerka, want this case wrapped fast (Gan was an old friend), before it gets out of hand-and their chamberlain, Sir Rommett, isn’t exactly the most helpful of people to the Guard. Which makes life especially unpleasant when one of Gan’s companions ends up dead in the same inn…. DeCandido’s put together a pretty good setting; Cliff’s End is a smorgasbord of the people populating the land of Flingaria; the land itself has gone through some rough times, and the heroism of Gan and his crew was one of the main reasons why it has entered a peaceful period. Magic is regulated by the Brotherhood of Wizards, in part because of past abuses by wizards such as Chalmraik. Many elves see humans as lower life-forms. There are also dwarves and halflings in Flingaria (and I believe trolls are mentioned somewhere as well). The story itself, however, is contained within Cliff’s End, and there’s enough here to tell a great many stories; from the upper-class areas of Unicorn Precinct, the docks of Mermaid, the seedy Goblin, and Dragon-which seems to hold the middle-class. Since there’s no map of the city, one could easily guess that there may be more regions in the city as well. Dragon Precinct has a number of minor subplots rolling along too; Danthres and Torin aren’t the only detectives in the city, and we get a look at some of their workload as well. But the bulk of the story follows Danthres and Torin in their investigation (with some aid from the M. E. Boneen; Boneen’s a Magical Examiner on loan from the Brotherhood). Both characters have their separate backstory (Danthres’s is a bit more heavily explored here), which affects their actions during portions of the investigation. They’re hampered by the fact that there isn’t a lot to go on-at least at first. There aren’t a lot of books in fantasy that deal with general crime in a city. The only ones that come to mind immediately are the Discworld City Watch books, which tend to be somewhat less than serious in tone; a pair of Joel Rosenberg books which wasn’t so much city crimes being solved; and I think one of Saberhagen’s Lost Swords books had a detective tone in it. None of them quite hit the right flavor for a police drama in a fantasy setting, though-and that’s what Dragon Precinct has accomplished. It’s got a good core of characters, a diverse city setting, and plenty of room to write more stories-not to mention a potential loose end that’s a little beyond a city guard to handle (it’d be a neat thing to follow up in passing in future stories though). I believe I’d enjoy reading more stories set in Cliff’s End. That’s not hot chocolate, is it? ‘Cause you know what happens when you order hot chocolate. The oddest thing about this book is its origins. This book began life as a series of E-books. I never read ’em; didn’t have the motivation to shell out dollars for something to read on my screen; it’s also why it never appeared on my site here, since I made a deliberate decision early on to stick with the print media. E-books and audiobooks need not apply. Apparently, though, the editors at Pocket Books-eager to make more money, I expect-decided to release the first four stories in paperback form. That brings us to the present: Have Tech, Will Travel is the story of the Starfleet Corps of Engineers, an organization that lives for all the technobabble that you’ve seen before in books and television (and occasionally movies). They aren’t out to seek out new life and new civilizations; they are out to play with alien technology and fix problems that are way too big for a standard starship crew. To borrow a phrase from the book, “If anything in the galaxy needed to be built, rebuilt, programmed, reprogrammed, assembled, reassembled, or just understood, the S.C.E. was who you called in”. In this case, it means if there’s a massive starship that mysteriously attacks the U.S.S. Enterprise, or if there’s a worldwide computer system on the fritz, or other equally interesting problems, the starship U.S.S. da Vinci is sent to investigate. The captain of the ship is David Gold, a contemporary of Captain Jean-Luc Picard; however, the commander of the crack S.C.E. team is Sonya Gomez, who was formerly assigned under Geordi La Forge. Other notable team members are the bonded Bynar pair 110 and 111 (they’re great with computers), Domenica Corsi, the chief of security for the S.C.E. (and with a nickname like “Core Breach”, you just know what can happen! ), and Dr. Lense, who joined the S.C.E. to get away from doing combat medicine (which may have proven to be a big whoopsie). This book has four stories, so I’ll get right to it. 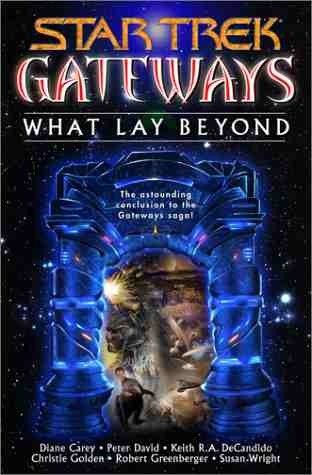 The first story, written by Dean Wesley Smith, is “The Belly of the Beast”. The U.S.S. Enterprise has just finished defeating a mysterious, huge starship, and Captain Scott (of the original series) sends the da Vinci to figure out why it attacked an agricultural colony. We get our first look at the dynamics of the crew, which I found to be a little easier to believe than most of the other crews that have been put together solely for books. The second story is “Fatal Error”, by Keith R. A. DeCandido. In this offering, the S.C.E. is asked by the planetary computer of Eerlik for aid, as it is beginning to experience malfunctions that its caretakers are unable to handle. What they find is that the situation is considerably more complicated than that (par for the course for Star Trek). This one also begins to delve into the various personalities of the members of the team, and introduce a couple more. One of the things I enjoyed about Have Tech, Will Travel is the slow revelation of who’s on the team. The third is “Hard Crash”, by Christie Golden. 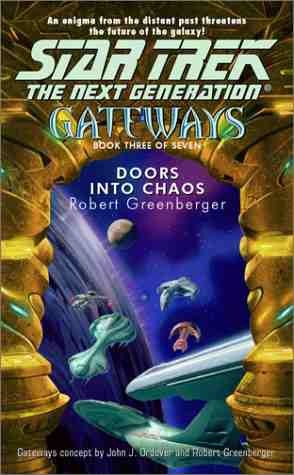 It wraps up a couple of subplots begun in the first story, and hits the world of Intar, as an alien craft crash lands in the capital city, and becomes a problem very quickly. The discovery of its pilot leads the crew to a rather frightening possibility for the S.C.E., as they wonder if they’ve run into a threat far too big for them to handle. We get the first look at the da Vinci’s EMH (Emergency Medical Hologram), which seems considerably more stable than the one on Voyager (or, for that matter, the one that was on one of its episodes being hyped as the Mark II). I sincerely hope it’s not overused. The final story in this book is “Interphase, Book One”. I know-not another cliffhanger! But from what I understand, the second book will not be long in coming (although readers of the E-books undoubtedly are chuckling behind my back as I write this). It involves a mysterious ship suddenly appearing in Tholian space, which instantly gets Captain Scott’s attention-especially since it’s a Starfleet ship. But there are those who don’t want the starship recovered…. This one was written by Dayton Ward and Kevin Dilmore. Amazingly enough, I rather enjoyed all four stories. All were fairly complete, and had solid plots; perhaps stories averaging slightly under a hundred pages removes the need to fill a Star Trek book with fluff. I also like the concept of the S.C.E. They aren’t out to do the big things, like save planets or galaxies or entire civilizations; they aren’t out to fight the Dominion or the Borg or the Romulans. They’re out to fix and understand things, and it’s nice to have a break from the Big Ideas. While this book hasn’t changed my stance on E-books (sorry Pocket Books! ), I will be more than happy to keep purchasing paperback collections if they’re of the same quality as Have Tech, Will Travel.